An unnamed “city by the sea” in 1975 India is the setting for Rohinton Mistry’s A Fine Balance, where four people from different walks of life make unlikely companions in the midst of the government-declared State of Emergency. Dina, a spunky widow, rents an apartment in the city, where she has her two hired tailors, Ishvar and Om, work clandestinely. Maneck, a college student from a fairly prosperous hill town, rents the spare room in Dina’s apartment. Their relationships evolve from distrust to friendship, eventually turning familial and loving. But the journey each takes to reach that point is nothing short of harrowing. A Fine Balance is an epic work, to say the least. When I said this book takes place in 1975… that’s not entirely true. Mistry fleshes out each character with elaborate, detailed life histories, each section bringing the reader up to the 1975 “present” of the book. We learn of Dina’s sad childhood and young marriage, with a controlling and self-righteous older brother. The tailors Ishvar and Om came to the city to make a living, in an attempt to escape the brutal caste violence of their country village. Maneck fled his dormitory after facing cruel abuse and to avoid the growing tension among students and administration there. It is not explicitly stated in the book, but obvious that the State of Emergency is the real one that took place in India from 1975–77 under Prime Minister Indira Ghandi (who goes unnamed, but is referred to). The political unrest in the story results in a corrupt police state across the country, where anyone without riches or power is unfairly forced into uncertain and shockingly dire conditions—facing violence, danger, poverty, and often homelessness. This book is dark. The characters are destitute, piteous… yet not without hope, not entirely humorless. There are moments of tragicomedy, moments of beauty, moments of love. The four protagonists’ relationships are truly moving and wonderful by the end. You feel so deeply for them—going through so many trying hardships—I was distressed and terrified for them during several scenes. The characters face the inexplicably unjust events in their lives with dignity and courage, though. Mistry’s prose is delicate and polished, visually and emotionally evocative, and left me breathless at the end. 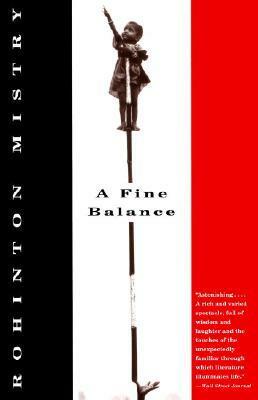 The scope of A Fine Balance is staggering and broad, but the stories of the characters are intimate and complex. At times while reading I found myself thinking a scene here or there, or seemingly random minor characters were perhaps unnecessary, but everything is needed and comes together by the book’s conclusion. Not one thing is superfluous. While not a pleasant or light read, A Fine Balance is important for its portrait of political/socioeconomic austerity and the depth and substance of the human spirit. The characters became very real for me, and I thought about this story for days after finishing. It is a heartrending, beautiful work and I will definitely follow this author. The abstract of Family Matters intrigues me: a patriarch with Parkinson’s needs care at the end of his life, and his family’s actions in dealing with his needs. Read from September 9 to October 28, 2012. This entry was posted in books and tagged drama, economics, family, fiction, friendship, history, politics, society by kristin @ my little heart melodies. Bookmark the permalink.